A Few Minutes of Filmmaking: 'Game Night' Incredibly Underrated? So it just occurred to me that sometimes, in our typical film watching, we find a film that catches us off guard. Not necessarily in a bad way, but more of something we have no desire to see in theaters, but when we finally see it (whether it's Netflix or Redbox), it's actually pretty great. For me, the film Game Night was that film. Having seen a trailer here and there, I found myself having no interest in seeing it. Sure it had Jason Bateman and Rachel McAdams in it, but the overall film looked rather weak. The plot seemed pretty basic and it wasn't anything that struck a nerve in me to go and see it in theaters. Fast forward to June 2018, I found myself at a Redbox inside of a Walgreens. There wasn't a whole lot that stuck out to me, but after searching for a few moments, I noticed that Game Night was available. Taking a quick moment to look it up on my phone, I noticed that the film received an 83% on Rotten Tomatoes. With the RT score persuading me, I decided to rent the film. Once I returned home and got comfortable, I popped the disc into my DVD player and spent the next hour and a half watching it. Let me just say that I was really impressed with the film. Yeah the plot was pretty simple, but the director, as well as the writer, did a phenomenal job in making a simple film so enjoyable. Now you're probably wondering why I'm giving such high props to the film. For that to be answered, continue reading! Within the first few minutes of the film, I found myself impressed with it. The comedy in it was well written, providing jokes that really hit the mark in terms of timing. Sometimes with comedies, even if there are big named comedians such as Kevin Hart, Adam Sandler or even Will Ferrell in said films, they fall short of being funny. A lot times these said comedies are only funny because of said person. Because it's Will Ferrell saying said joke, it automatically makes it humorous. In reality though, the writing isn't necessarily that great. Now, with Game Night, it's completely opposite. In this film, because of the writing, the jokes hit the mark in terms of timing, the humor is actually funny, and the delivery of the jokes by the actors and actresses are near perfect. I found myself throughout the film laughing because of how relatable and how clever a joke was. I think one of my favorite comedic moments in the film had to be Max (Jason Bateman) and Annie (Rachel McAdams) Davis and the introduction of their neighbor Gary (Jesse Plemons). Having just arrived home, the two are encountered by their neighbor. Throughout the whole scene, Gary stretches out the conversation in hopes of finding out if they're having a game night or not. Of course, Max and Annie are, but they don't want to come out and say that they didn't want to invite him. Thanks to the writing, an awkward tension is created. In addition, the use of odd dialogue for Gary and Jesse Plemons' delivery of the lines creates a creepy yet memorable character. It's definitely a character that everyone is familiar with because of everyone has had an encounter with someone similar to Gary. Whether it be a family friend, coworker, or just like Gary, a neighbor. There are moments throughout the film where I'm honestly wowed by the creativity and the little things that went into it filmmaking wise. During some of transitions into the next scene, the film made it so that the scene's area had a board game feel to it. Don't know what I'm talking about? Let me explain. Whenever Max and Annie make it home (just right before their encounter with Gary), the camera slowly zooms into the neighborhood they live in from an aerial perspective. During the zoom though, the neighborhood almost looks like model homes that you could see on a board game or even a model train board. It's just a little thing that the film didn't have to have, but because it's in the film, it makes me have more respect for it. It's the little things that count. Another great part to include is the very beginning. When the film introduces the audience to the characters Max and Annie, it shows a montage of how they met and their time together before marriage. At one point during the montage, the two are kissing on a subway before the subway jerks violently, causing the two to fall over. While they fall over, it transitions into the next scene, in which the transition includes them about to hit the floor and a pair of dice hitting the game board of Risk. To me, that's probably one of the smoothest transitions to the next scene I have ever witnessed. Again, the film didn't have to include this and the director could've easily just cut to the next scene, but the fact he didn't really makes me appreciate this film even more. Remember how I said the film had a pretty simple plot? Well, I didn't necessarily believe that this film could have twists. You have films like Empire Strikes Back that surprised you with the twist that Darth Vader was actually Luke Skywalker's father (don't act so shocked, you had 38 years to watch the film). With films like Game Night, what could there possibly be? If you're not familiar with the plot of the film, basically it goes like this. 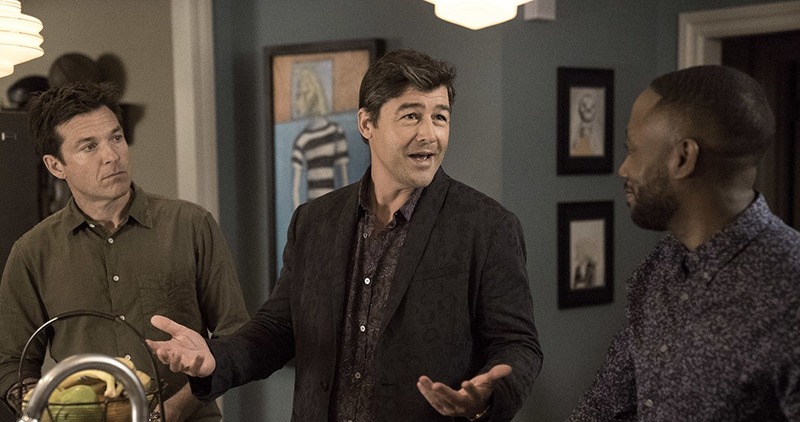 Max's brother Brooks (Kyle Chandler) hosts a game night at his house in which he tells all of their friends that it will be a game night to remember. Having the intentions of making a sort of murder mystery party game, he plans on having one person "kidnapped" in order for everyone else to try and find said person. Unfortunately, game night is ruined when Brooks is taken by actual kidnappers while everyone else still thinks it's a game. Now with that synopsis, there isn't a whole lot that could happen. It's very predictable. Everyone comes together to try and save Brooks, only to save him in the end and they all live happily ever after. Yes that is what happens, but there's a lot more to it that's unpredictable. Throughout the entire film, there's a total of four twists (at least what I saw). I would tell you about all of the twists, but I'd rather have you discover them on your own. So, with that being said, I'll leave you with a hint at each spoiler. This film was overall fantastic. I believe that it's very underrated though, due to the fact that there wasn't a whole lot of commercials for the film. Not only that, but the Marvel blockbuster Black Panther came out around the time Game Night was released. I think with that said alone you can understand why this film wasn't as remembered. Despite this, it's a wonderful film that you should definitely watch, and I am quite impressed with the filmmaking.